While I was at BlogPaws 2012 I was given the opportunity to attend a pawsome rocking lunch hosted by PetSmart to announce the launch of their Bret Michaels Pets Rock collection! I was thrilled to receive a Pets Rock wardrobe! These clothes and accessories are pawsome! High quality and rocking style! My pawsome new Bret Michaels Pets Rock wardrobe from PetSmart. I really like the pink and black dress! I can't keep my paws off it! BOL!! You'll notice I am either laying on it or have a paw on it in every photo! BOL!! I am saying "MINE!" BOL!! This picture is to help your people compare sizes to each other. The dresses compare large to small, the coat is large to medium. I wear a large in all the clothing. I have a 20 inch girth and 16 inch length. I have a 13 inch neck, so the large collar on the tightest hole fits me. A medium is probably my real collar size, but the smaller the size, the narrower the collar, and it takes a thick collar to show with my fluffy neck ruff. BOL!! Now for the photos of my modeling session! I love this dress!! Yes, that is a metallic pink bow in my fur! BOL!! Check out the studded cross and belt details! Pawsome!! I love how the studded pleather belt detail contrasts with the lace petticoat on this skull dress! The pink flame bow is adorable! Feminine and still rocking! Pawgeous! The belt shows great in this photo and I love how the frilly skirt flows with my long plumy tail! What girl doesn't love red roses? I love how classy this rocker girl dress looks. A pink bandanna is always a nice touch. This black leather collar is pawgeous! I love the embossed detailing, silver hardware, and red stitching! Bret Michaels signature is on every item in the Pets Rock collection! Pawsome!! The leashes and collars are beautiful! Real leather! This rose bowl is pawfect for me! PetSmart is even going to send me one of the Bret Michaels Pets Rock beds that I like so much!! Pawsome!! The Flame Dew Rag rocks!! One lucky reader will win the size small Flame Dew Rag I am modeling in this photo! One lucky reader will win this Large Pets Rock Flame Bowl! It is top rack dishwasher safe! Mom loves when she can put dishes in the dishwasher instead of hand washing them. BOL!! LOVE all of the outfits! You look adorable! OMC (that's Oh My Cat)...Coco says you Rock in all those outfits and she thinks you and she should go out on the town sometime! Teri wants that Dew Rag for Disco NoFurNo, to go along with his 'Flame' walking harness!! Hi Coco, Teri, Disco NoFurNo! Disco should enter the giveaway!! I bet the Dew Rag would look pawsome with his flame harness!!! High Paw Coco!! Let's Rock the town with our style!! You are a bootiful model, Pepper! You ROCK!! WOW!Super Pepper and Very Pawsome! Wow Pepper you grabbed a lot of stuff. I didn't get too much mainly because it wouldn't all fit in my bag. Also, sizes were a little small for my dogs and I didn't think my manly dogs would look to good dresses. BOL!!! Good point! BOL!!! Big manly dogs in little girly dresses! Thank you! Thank you! One lucky reader will win it! Pepper. You just rock those clothes. You look absolutely pawsome. You gonna wear them to #nipclub? Thank you! Of course I'm going to wear them to NipClub! BOL!! 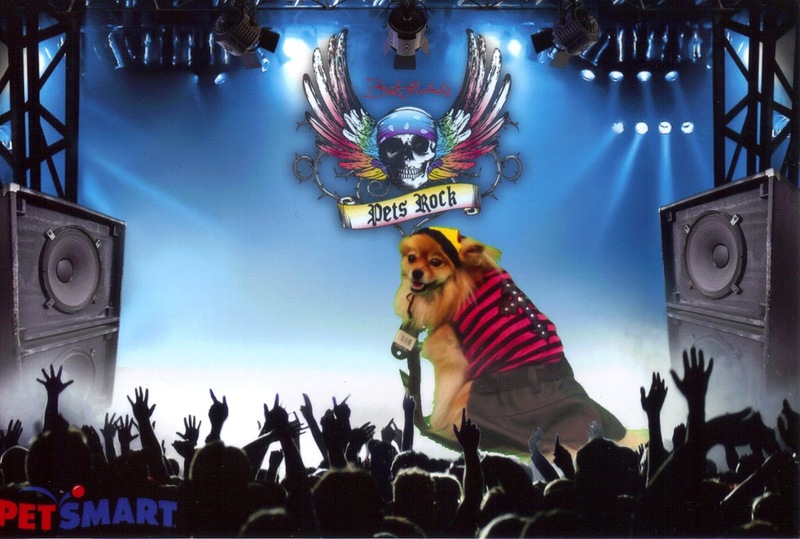 I like the Bret Michaels Pets Rock™Cuddler - Blk/Pink and we are small dogs here. I love the cuddlers too! I can't wait until mine arrives! I like the Spiked Rubber Ball w/Bandana. I have a big dog. That sounds like a fun toy! OMG Pepper these outfits are the most adorable things i have ever seen. Mum is certainly getting some for me! woof woof!!!! Have you noticed this year they're limiting what they make in a size large? All the cutest dresses only go up to a size medium. I've complained to corporate when they started doing this last year (remember the off the shoulder silver and black pleather skull dress that only went up to a size medium?). Now there's an adorable neon striped 80's dress Nezzi can't wear. Maybe if you complain they'll listen to you. Because I can't take this dangling the carrot in front of my face thing when I'm freaking starving for well made affordable stylish clothes!